Our Bosch Service National Guarantee policy is complimentary for all customers. Bosch is a household name, offering thousands of products from domestic appliances to power tools with an outstanding reputation for quality. For over 125 years Bosch has invested in making the future of mobility; clean and economical, safe, convenient and comfortable. Bosch is a recognised world-wide supplier to the automotive industry which is renowned for offering reliability and innovation. The Bosch Group accompanies a vehicle throughout its entire life cycle – from research and development to production and full expert care from Bosch Car Service. SLP Autos Limited is an independent authorised Bosch Car Service and Repair Centre. 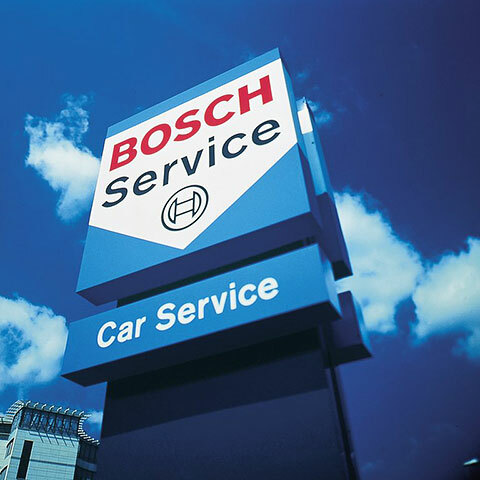 We are members of the Bosch Car Service network and are your local centre for Chelmsford, Essex. As a Bosch Service Centre we uphold the excellent quality standards of Bosch in terms of parts, training, service and cover for both our work and the parts that are fitted to your vehicle. Our team of Bosch trained experts are fully trained and equipped to deal with the latest automotive technology in vehicles of all makes and models. Our skilled team know how to service, maintain and keep your vehicle in perfect working order. You can rest assured that your car is always in the best possible hands when you take it to Bosch Car Service for maintenance and repair. With our comprehensive range of garage services we can always offer our customers just what they need to maintain their vehicle. Our full range of services are available for all types of engine as well – whether petrol, diesel, electric or hybrid. As a Bosch Car Service workshop we have undergone a systematic certification process and are committed to constantly improving our quality assurance standards. No loss of manufacturer’s warranty coverage: We perform all repair and maintenance work to the required specifications of the manufacturer, which means your vehicle remains fully covered under it’s warranty. Professional Technicians: All our technicians are fully qualified and able to use the latest equipment. Genuine Parts: We make exclusive use of genuine parts or high quality replacement parts to ensure your vehicle performs to its best and retains its value. Conscientiousness: You can rest assured we will take great care of your vehicle and we always adhere to the applicable safety and environmental standards. Everything a car needs: We can provide expert advice on all aspects of the car as well as perform MOT Tests, servicing and maintenance, repairs and retrofitting work. Time saving: If you need to bring your vehicle at short notice and we will perform repairs as quickly as possible to ensure you never have to wait longer than necessary. Mobility: If extensive work is required, we will keep you on the road whilst your vehicle is being repaired by providing the use of one of our courtesy vehicles when available. Transparent Costs: We will examine your vehicle before we start work and give you a detailed breakdown of all the parts, work and time involved, so you know exactly what everything will cost right from the start. Fair approach to repair work: We only ever repair what is really necessary. We will always endeavour to offer professional advice if we feel anything additional should be considered, so as to act in the best interests of your safety and minimising any further problems with your vehicle. Customer Approval: We will always check with you first before performing any extra work to your vehicle. Part Check: We keep any removed parts just in case you wish to take a look at them when you collect your vehicle. Timely Service: We always endeavour to keep to the deadlines we promise. In circumstances where we find any additional work needing to be done, we will advise you of the costs and. Reliability: We fully honor the agreements we make with quality parts and service. Professional Handover: A qualified member of our team will explain the work performed on your vehicle and the invoice when you come to collect your vehicle. Personal Service: We extend our customers the courtesy of listening to what they have to say and are always happy to offer professional advice on everything to do with your vehicle. Full Commitment: We endeavour to do everything we can for you and your vehicle. Our customers can rely on us to find the right solution to even the most awkward or extraordinary problems. SLP Autos Ltd © 2019 All Rights Reserved.